Words are a minor component of A Thing Mislaid. It’s an enigmatic and often impish two-hander from Maison Foo, a company now in its 10th year of creating what it describes as “absurd pieces rooted in social conscience”. The production is about migration and encounters on the road – sometimes frightening, sometimes surreal. To create this show Maison Foo has worked in conjunction with City of Sanctuary, a national group working to create a climate of welcome for asylum seeker and refugees. The action surrounds a hunted figure fleeing from something or somewhere unspecified. She’s clutching her one possession, an umbrella, and every muscle in her body conveys the intensity of the experience. 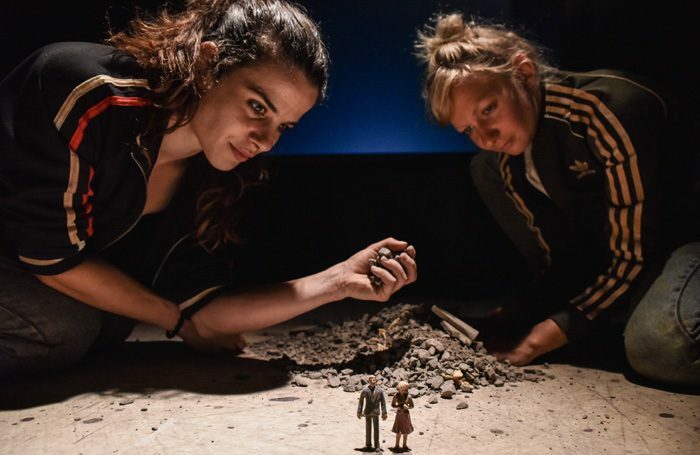 A Thing Mislaid is an elusive and haunting piece that never explicitly tells us who these characters are but which still manages to confront us with the reality of the refugee situation. Clowning is used to aid the storytelling and what dialogue there is has a Beckettian quality. Performers Teele Uustani and Raquel Pereira have perfect comic timing – particularly during an episode where they adopt a new identity and another where they play out an imagined scene in a restaurant. The two actors use a hand-held video camera to film scenes using miniature puppets that mimic their own movements. It’s mesmerising to watch.